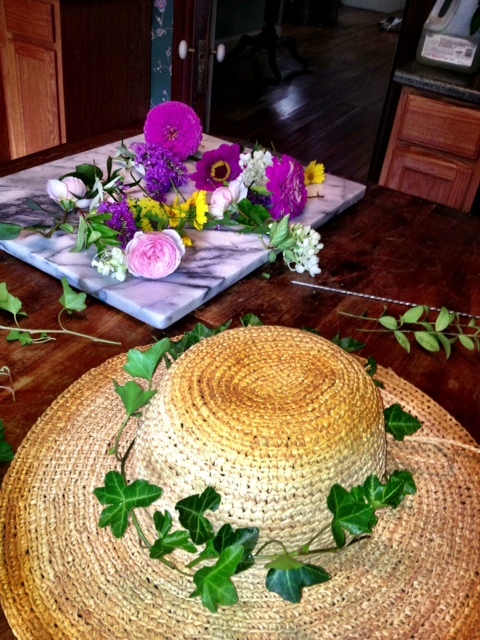 When I was invited this year to a Labor Day weekend garden party in Columbia County, in New York's Hudson Valley, my first thought was: Gotta have a hat. I'd been to lots of garden parties back in my undergraduate days at Trinity College, Dublin. You could not show up for these events, as a woman, without a serious hat. The school at the time was very upper-class Brit. All sorts of subtle signals -- accent, table manners, writing paper, fountain pens -- were being sent out all the time, announcing just where in the social hierarchy you fit. As a Californian I was sort of exempt. No one expected me to be exactly normal, so I could just observe and conform -- or not -- as I saw fit. But everybody, native or foreign, had to have a hat at garden parties. Maybe the convention emerged in response to the rainy weather. A broad-brimmed hat protected you, like an umbrella. 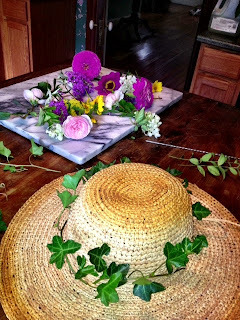 So, a couple of weeks ago I found the San Diego Hat Company hat in the picture and decided to adorn it with whatever late summer flowers I could find in the fabulous garden of my hosts, Will Swift and Kevin Jacobs. Above is a shot, taken in their kitchen, with Kevin, a master gardener, having just begun the project with ivy tendrils. The skewer to the right is a tool he repurposed to enlarge the holes in the straw mesh so the flower stems would fit through (they just hang inside and don't bother your head one bit). In the background of the photo are the roses, zinnias, tree hydrangeas, rose of Sharon, coreopsis, goldenrod, pachysandra (perfect hat greenery) and vinca you see in the finished product below. (If Kevin decides to post the process in more detail on his wonderful blog, A Garden for the House, I'll post it in turn here.) Learning from Kevin, I made another hat myself for the party's hostess and loved the creative charm of the whole process. The flowers are just a little droopy after a long delightful day being pretty. And by the end of the party (a terrifying thunder storm drove us inside) the guests had decided that every future garden party should have flower hats like this. 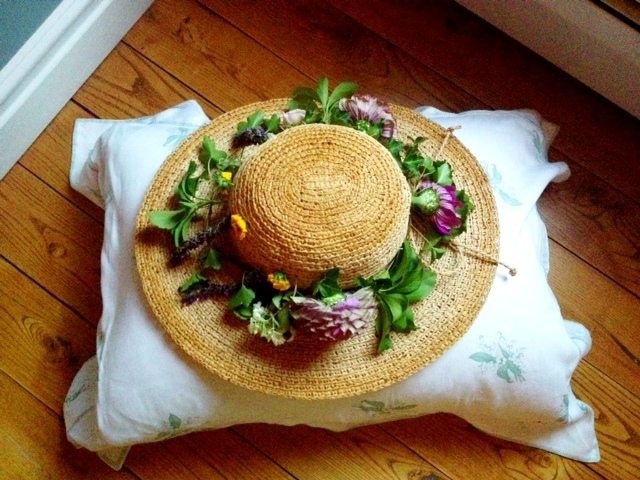 Instant Gratification: "Your favorite hat"